Zint Marine Collagen rejuvenates your beauty and youthfulness from within. By replenishing your body’s declining collagen supply, it aids the strength of your hair and restores the moisture and smoothness of your skin for a more youthful complexion. It also restores the suppleness of your joints for carefree movement and activity by nourishing your body’s connective tissue, including cartilage and tendons. Our collagen is highly neutral in flavor and dissolves easily in cold water without thickening. We source our marine collagen from the scales of non-GMO wild-caught snapper from the South Pacific, making use of by-products that would otherwise have been discarded. Not only does our all-natural approach ensure a premium collagen product in both nutrition and taste, it employs sustainable practices that minimize our environmental impact. Completely neutral in flavor and texture, our collagen hydrolysate powder is highly bioavailable and dissolvable in cold water. Mix it in coffee, smoothies, salad dressings or your favorite recipes for a simple way to supercharge your anti-aging supplement regime. Zint Collagen Hydrolysate helps to reverse that decline. By providing key amino acids that trigger the body to produce more collagen, it assists in building muscle, protecting joints, increasing energy and supporting weight management. It’s also a boon to beauty, with improved skin moisture levels, renewed skin smoothness and suppleness, reduction of micro-relief furrows and prevention of deep wrinkles. 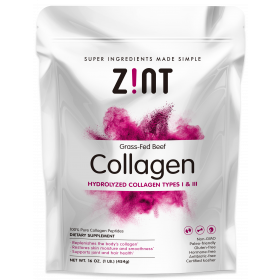 Is Zint Collagen type 1, 2 or 3? Zint Marine Collagen is comprised of both type 1 and 3. Type-1 collagen is the most prominent matrix of protein in the skin and is responsible for making skin firm. Type-3 collagen is found in human tissue, giving skin its plumpness and soft texture. As we age, the stronger type-1 collagen gradually replaces type-3 collagen, and the skin begins to lose it youthful properties. How much Zint Collagen should I consume daily? In order to experience the maximum benefit of Zint Collagen, you should ideally consume two tablespoons per day, broken out in two separate doses: one in the morning and one in the evening. Whst is the molecular size? The molecular size for the marine collagen is between 3,000 and 5,000 daltons. Most of it will be in the 3000 range. Does the Marine Collagen have a fishy taste? I like the fact that it's made from the scales of wild caught snapper. The odor which all collagen and gelatin have is almost imperceptible. It dissolves very well both in hot and cold liquids. I put it my hot spearmint tea. I tried another marine collagen from a different maker but it had a weird perfume smell to it, so zint Marine Collagen is clearly superior. If you are having wounds or fistulas, I take a lot of this in a day which helps build the skin up and close those fistulas. I had one in my abdomen and worked out great to heal. I also used Seacure to heal as well. When the body needs repair, you need excess protein from powders like this to help heal. I've only used this once so far - it just arrived today - but it had no taste, no smell, and mixed into my warm drink completely, helping resolve some other powders that would clump otherwise. I'm very happy with it as an addition to my morning beverage.